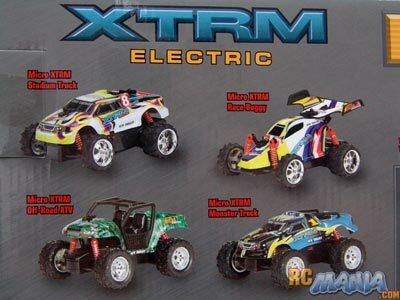 The New Bright Micro XTRM looks great in the box and comes in four completely different body styles. The top two pictured above have narrower tires in the front than in the rear, while the two on the bottom have the larger tires all around. I picked one with larger tires because I figured that would help it to get over obstacles more easily. It includes all of the alkaline batteries you need to run, no extras and no charging required. The tires are a soft, sticky, quality rubber compound with a good tread compound that's sure to get good traction. The suspension is soft, which should really help to smooth out the ride over bumpy terrain. It also has a four-band radio system that lets up to four Micro XTRMs run at the same time. You don't have to worry about making sure one vehicle is 27 mhz and the next is 49 mhz, you just flip a switch on the controller, and another one in the battery compartment on the truck. So far it seemed like a good value, but I had no idea how it'd actually perform. Well, since the batteries are included, all you have to do is pop 'em in and go! Can't get any easier than that. 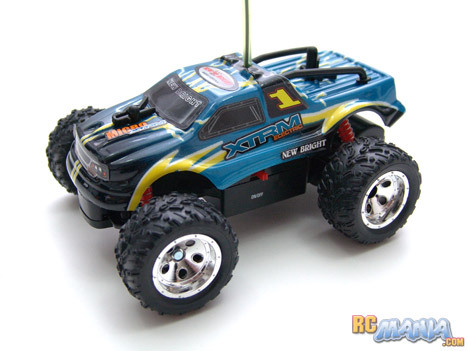 With just three little AAA batteries powering the truck, I did was worried that the Micro XTRM would be slow. Thankfully, I was wrong. It's almost the perfect speed for its size, and as a bonus, it has digital proportional throttle, meaning how fast it goes depends on how much you squeeze the trigger on the controller -- it's not just off & on. The steering response is pretty peppy, too, though there's no proportional action there, just straight, full left or full right. My only complaint is that the truck is underpowered in reverse. As expected, the grippy tires keep it from spinning out easily on dusty surfaces, and the soft suspension lets the truck easily make its way over bumpy terrain like a brick walkway or even small gravel. Because of its size (barely over 5 inches long) it can't take on really rough ground with big rocks, but medium-pile carpet and any moderately smooth, normal dirt surface with no grass or leaves seems to be just fine. It does really well taking small jumps, too, and it's really fun to set up an indoor obstacle course with all sorts of little ramps, as long as they're wide enough that it's easy to hit them right. New Bright has done a nice job with the Micro XTRM. It's a nice small size that is appealing to all ages that would play with it, it comes with batteries (though you'll want to get some rechargable AAA's for repeated use), and it performs very well for the price. Good deal, and I'm glad I tried it out!